Soil conditions are ideal for dormant lawn seeding from February to March. If soil temperatures remain 50 degrees Fahrenheit or less, seed will stay dormant until temperatures rise in spring. » Dormant seeding provides a longer window of time for seed to germinate and establish, which is especially beneficial if you plan to apply a spring lawn fertilizer and weed killer. » Winter seeding gives you a head start on lawn repair. 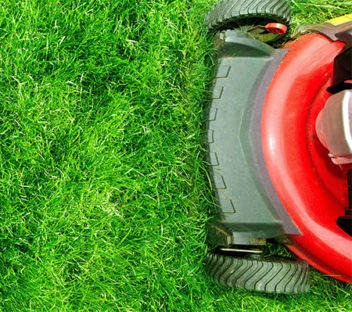 Schedules tend to fill up once the weather breaks in spring, so you’re less likely to miss the optimal window for spring lawn renovation. » Soils tend to stay moist in winter due to snow and rainfall. Additional watering is usually not necessary. Remove debris and apply seed over thin or bare spots in your lawn. As your lawn freezes and thaws seeds will bury into the soil and germinate when it’s time to sprout. Wait until seeds germinate and grow a full 2 inches before applying weed killers. When seeding, we recommend a premium mix such as our signature blend, Delhi Fescue, a top quality grass seed mixed with our local environment in mind. For new lawns apply Fertilome New Lawn Starter Fertilizer. Create a lush existing lawn that lasts with the Fertilome 3 step Lawn Program. Step 1: Apply Fertilome For All Seasons Lawn Food Plus Crabgrass And Weed Preventer with Prodiamine in March/April. Prodiamine gives your lawn just the right amount of nutrition it needs for healthy growth this after a harsh, depleting winter. Step 2: Apply Fertilome Lawn Food Plus Iron in September and again in November for fast greening, strong roots, and long-term stability.